Two of the UFC’s most exciting welterweight fighters will clash at UFC on FOX 9 this December, as UFC officials recently announced that Carlos Condit (29-7 MMA, 6-3 UFC) and Matt Brown (18-11 MMA, 11-5 UFC) have agreed to square off in Sacramento. 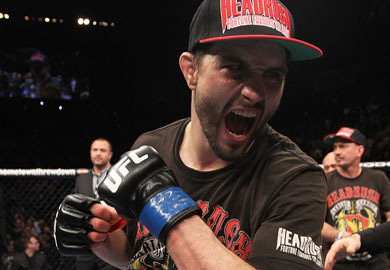 Former UFC interim-welterweight champion, Carlos Condit, most recently fought in the headlining bout of “UFC Fight Night 27,” where he was able to avenge his previous loss to Martin Kampmann, earning a fourth-round TKO victory over “The Hitman”. Prior to that, “The Natural Born Killer” had suffered back-to-back losses for the 1st time in his UFC career. Those losses, both of which came via judges decision, were suffered to current welterweight champion Georges St. Pierre at UFC 154 and #1 contender Johny Hendricks at UFC 158 respectively. Once viewed as a “Gatekeeper” for the 170-pound division, Matt Brown has been on an absolute tear as of late. “The Immortal” one has strung together six-straight wins, five of which have come by form of KO or TKO. Brown most recently KO’d Mike Pyle in just 30 seconds at the “UFC Fight Night 26″ event in Boston. During his current win streak, Matt Brown holds victories over, Jordan Mein, Mike Swick, Luis Ramos, Stephen Thompson and Chris Cope. Brown vs Condit is a dream match up.